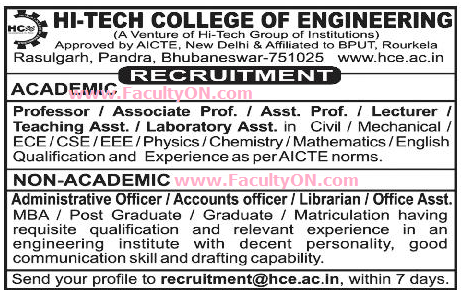 Hi-Tech College of Engineering, Bhubaneswar has advertised in the SAMAJA newspaper for recruitment of Professor / Associate Professor / Assistant Professor / Lecturers Plus Non-Faculty jobs vacancies. Interested and eligible job aspirants are requested to apply within 07 days from 27th July 2018. Check out further more details below. About College: National development and technology are two side of the same coin. One is in-conceivable without the other and it is education and training that fosters discoveries and inventions aimed at celebrating humanity. So is the case with the intelligentsias of Vigyan Bharati Charitable trust which establish to Hi-Tech College of Engineering. HCE, Bhubaneswar champions’ quality technical education aimed at churning out a new breed of technocrats – the brand ambassadors of the country in socio-economic front and nation building at large. The private engineering college/institute concerns itself with readying best technocrats of outstanding caliber having social and national commitment.